S.E.C.R.E.T. 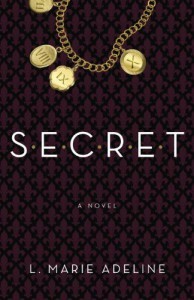 is the first book in the Secret series by L. Marie Adeline. Cassie is a young widow whose life is filled with loneliness. Her life has become routine. Wait tables at work, home in her one-bedroom apartment with cat, repeat. But one day, a client at the café leaves behind a notebook. Cassie looks in the notebook hoping to find contact information for its owner and instead discovers explicit sexual confessions. The notebook eventually leads Cassie to an underground society called S.E.C.R.E.T. that helps women make their sexual fantasies come true in a ten-step journey.